As promised in my last post, this is the first post in a short series setting out my fifty favourite childrens’ books to compare to the Times list of 50 ‘must reads’ for the youth of today. Like The Times, I’m going to try to stick to books that I consider to be childrens’ books. I don’t recall the concept of YA being particularly well-developed in my day - there were just childrens’ books and adult books and one jumped from one to the other quite abruptly, via a short period of mixed reading. Consequently, many of my favourite reads from my childhood are books that we would normally think of as being adult reads - the likes of Wodehouse, Waugh and a plethora of detective stories. So, once these are taken out of the equation, I was really left with the books I read from the ages of about 6 through to 11 or 12, by which time I was reading almost exclusively what we would regard as adult books. I’m not sure whether I would have preferred to have had access to today’s acclaimed books for teenaged audiences - I sometimes wonder whether they are really necessary or whether we would do better to encourage teens to engage with good adult writing. That’s not a criticism of either young readers, their mentors or the authors of teen books; it’s really just a vague feeling that, in over-focusing or categorising, we end up limiting ourselves or our children. In any event, I can’t say that I feel I missed out. Unlike The Times, however, I haven’t limited myself to one entry per author - writers like Roald Dahl, who delighted me as a child deserve more than one measly shout-out. I’m going to list my favourites ten at a time and they are in no particular order, although they are, of course, very much “of a time” - in my case the late ‘70s! so. I LOVE this book. I love the fantastical sweets and chocolates, I love the incredible world of Wonka, I love the slightly strange ambiguity of Wonka and I love the whole golden ticket idea……..and who wouldn’t love the idea of owning their own chocolate factory, filled with Oompa-Loompas. The nearest I ever got was a visit to a Nestlé chocolate factory in Switzerland on a school trip in 1981 - at the end we were given 90 seconds to grab as much chocolate as we wanted from a massive sample table. Happy days. I’ve already read this to mini-Falaise, who was gratifyingly enamoured of it. Anyone who has followed this blog over time will be aware of my Tolkien-love and, as I’ve posted on The Hobbit before, I don’t intend to repeat myself here. Suffice it to say, this was the gateway drug for my youthful addiction to fantasy writing. The Times had it at number one and I wouldn’t be arguing against that. Simply wonderful stuff. There’s a beautiful Folio Society edition on mini-Falaise’s shelves for when she’s ready. I’ve written about this sequence of five fantasy stories before on here. The overarching plot of the cycle is the age-old battle between the dark and the light set in a Celtic-Arthurian background. The stories move from Cornwall to Wales and the heart of England and the tone varies from childrens’ adventure to something much darker as the cycle moves on. I can’t see how The Times managed to leave it off their list as it is wonderful stuff. 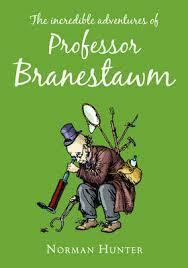 Professor Branestawm was an archetypal eccentric inventor who appeared in a series of 13 books written by Norman Hunter. I only read the first few as I’d grown out of them by the time the last ones were published in the ‘80s but I loved them as a young boy. Branestawm, who lived in the village of Great Pagwell, (surrounded by Little Pagwell, Pagwell Heights, Pagwell Gardens and several other Pagwells), specialised in weird and wonderful inventions that went spectacularly wrong, causing all sorts of problems for the Professor, his housekeeper, Mrs Flittersnoop, and his friends. As well as being very funny, the books were marvellously illustrated. Although many of the books are now out of print, a couple have been reissued by Red Fox and I must try and get hold of one for nostalgia’s sake. Wallander? Van Veeteren? Sarah Lund? Harry Hole? Frankly, you can keep your Scandi-noir detectives because Agaton Sax is the daddy of Scandinavian crime fighters. Sax, from Bykoping, was the hero of a series of stories such as Agaton Sax and the Diamond Thieves, Agaton Sax and the Max Brothers and Agaton Sax and the Criminal Doubles, in which he not aonly assists his hapless friend Lispington of the police but, in his spare time, runs Bykoping’s newspaper. The books are a pastiche of detective fiction and are hilarious. What really capped the English translations though, were the illustrations, drawn by the legendary Quentin Blake. She may be unfashionable now and distinctly un-PC but I used to thoroughly enjoy Blyton’s books as a boy. I can’t single out one Famous Five book for this list as I loved and read them all. Even in their newly-bowdlerised state, they remain good old-fashioned adventuer stories……..with lashings of ginger beer! One evening my father returned from work with two leather (or, more likely, faux leather!) bound books forTreasure Island. I read this one first and was captivated by it. Set in the English Civil War, its lead characters are the four Beverley children, orphaned by the death of their father, a Cavalier officer, at the battle of Naseby. When the Puritan forces burn down their home, they are presumed dead but, having been rescued by the local gamekeeper, they are hidden in his cottage. The plot focuses on the oldest boy, Edward, and his love for Patience, daughter of a Puritan. 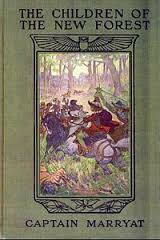 The book favours the Royalists and was one of the earliest true historical novels. It has stood up well to the test of time, having been written in the 1800s. Those dratted humans are building a big road through Wimbledon Common and Great Uncle Bulgaria decides the Wombles need a new home. Inexplicably, however, he sends out Bungo and Orinoco to scout for new homes, resulting in a trip to Loch Ness and Buckingham Palace. I liked all of the Wombles books (and the TV shows and pretty much everything Womble-related) but this one has stuck in the mind as being particularly fun. The books were reissued a couple of years ago and I’m looking forward to introducing mini-Falaise to them in due course. Crossing the Atlantic inside a giant, ripe peach with a cozy stone and a crew of talking over-sized insects? YES, PLEASE. Another storming effort from the Master, featuring the dreadful Aunts Spyker and Sponge and an unusual way of getting rid of the unnecessary parents - death by escaping rhino. Mini-Falaise loved it (although she got scared by the cloud giants) as I did all those years ago (without getting scared by the cloud giants - honest.). It’s about a pudding that reforms every time it’s been eaten. Yes, a never-ending pudding. Need I go on? Oh, OK then. It’s Australian and features three companions, including Bunyip Bluegum, a koala bear, who are constantly having to guard the pudding from the Pudding Thieves. Lindsay wrote it to win an argument that children would rather read about food and fighting than fairies. It’s for the younger reader but it’s great fun. 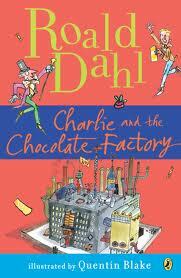 Charlie and the Chocolate Factory is by favourite Dahl. Made a visit to Cadbury World rather uninspiring! I agree with The Hobbit too. I refused to read The Famous Five because it was too popular, I read the adventure series, and the Secret Seven instead. We did have a couple of famous five audio books though, all the kids sounded like rabbits. Lucy - I do think Charlie is absolutely brilliant. It's great how each new generation still seems to love it as much. I loved all of those Blyton books and I think the Adventure series was actually my favourite. I did like the Secret Seven but they never grabbed me as much as the Famous Five. I've never read Susan Cooper. I was onto adult books by the time The Dark is Rising was published in 1973, and the 1st installment earlier passed me by. Something I was reminded of the other day as she features in a current exhibition at the Bodleian in Oxford. So I'm planning to read the first couple of books before I go. I've seen the publicity for that exhibition. I'd don't really get much opportunity to get up to Oxford these days otherwise I'd have loved to have gone to this. Hope you enjoy it.